Any time that you are away from your computer, it’s a good idea to lock the screen. 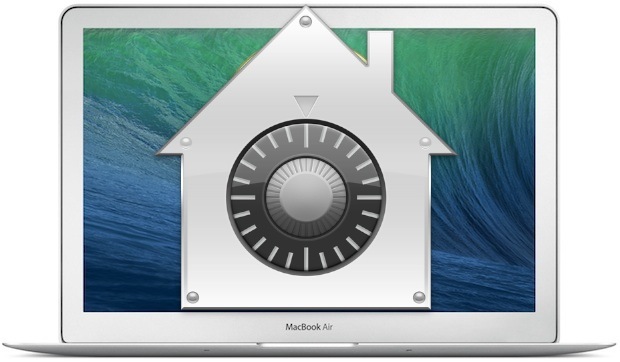 This provides a level of privacy and security to the Mac that is very easy to use and implement and it should be considered a must-use trick, particularly for anyone working in public spaces, offices, schools, or anywhere else that there is potential of an outside party accessing the computer. 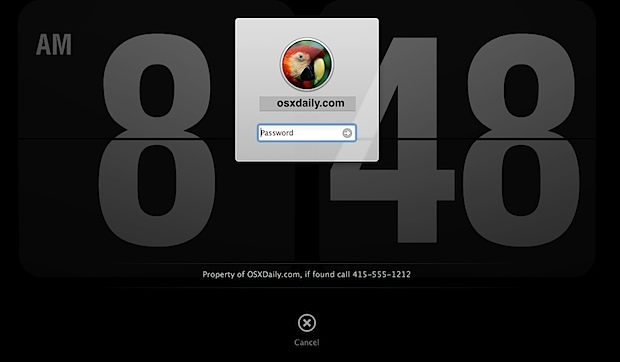 The fastest way to lock the screen of any Mac OS X computer is to use a simple keyboard shortcut. 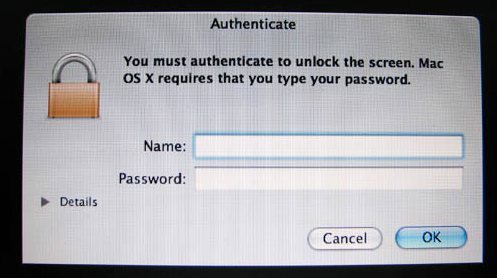 Hit the appropriate key combination for your Mac model and the Macs screen will instantly go dark, thereby locking it and requiring a user to enter a password before the computer can be accessed again. 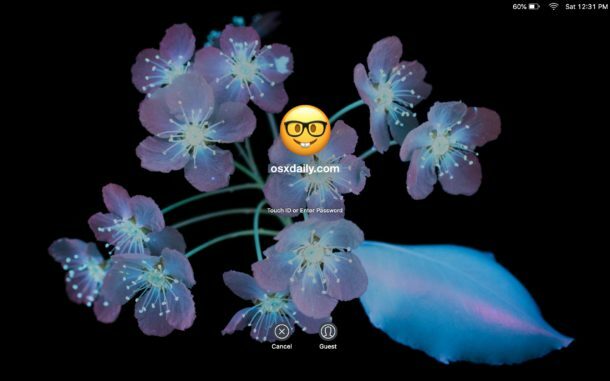 The Mac OS X lock screen is the same as what you see when you wake a Mac from sleep or a screensaver when this feature is enabled, so remember that if you use a screensaver that auto-activates or sleep your Mac regularly, you’ll also be entering your password when it is woken. Nonetheless, the setting and keyboard shortcuts are the same regardless of the version of Mac OS X, and the Hot Corner will work as well universally. I find that using expose active screen corners for this works really well also. Very quick way to lock by dragging the mouse to the corner. Thank you!! i never stop learning these things about my mac!! U guys rock for publishing things like this. Yeah… This is nice, but press the shortcut and then immediately move the mouse and you’ll be able to see the screen waked up you can see everything, control everything with the mouse, but it still asks for the password. This lock function on Macs or so buggy… To avoid accidents better use user switch and leave your mac showing the login screen. I Use Expose and this is the best for upper left corner. My Mac is set to lock after 60 min when put to sleep. Nevertheless my brother seems to be able to lock the screen instantly. Does anyone have any ideas on how he does it? The bummer about this keystroke, is that it locks the screen AND puts the display to sleep. I really with is just locked the screen (like the option in Keychain Preference). It’s a nice tip if someone really wants to sleep their displays. Not so hot if you just need it locked. Sleeping/Waking the screen every time I leave or comeback is a major pain. I don’t understand why OSX doesn’t have an easy keyboard shortcut to just lock the screen (without doing anything else). Works like a charm! Thanks buddy! Hi, new mac pro retina 13 does not seem to have eject button. Which combination will work the same? Great question! We just updated the article to directly address this. The keyboard shortcut for MacBook without an eject button is Control+Shift+Power, enabling the password option is the same though. Simply pressing the power button will suffice as well. If you hold the power button it will let you switch off the system. Command shift, eject, got it! Thank you very much! Using the power or eject buttons as part of the shortcut is pretty dumb considering most people that have a need to lock their laptops have a keyboard and mouse connected and the lid closed. Good job Apple. The article shows you how to lock the screen with the mouse by moving it into a corner of the screen. Also, all Apple external keyboards have an ‘eject’ button will can be used for the purpose too. CTRL + SHIFT + EJECT will not only lock your screen, but also eject a disk if you have one inserted. If this happens to be say, an OS disk you are using to install a VM, and it is taking forever, so you lock your screen to go on lunch, you may bone yourself. Apple: Isolate the damn eject key in this command so locking the screen does not also eject a disk which may or may not be in use. locking the screen does not work for me with shift + control + power. option + command + power does the trick on my Air running Mavericks though. My 4 yr old MacBook Pro froze up. I restarted & it wouldn’t let me open after putting in password. Then I did complete shutdown & tried again & it wouldn’t shut down, got hot & went to gray screen w/a 🚫in white on it. I looked here & decided to force shutdown w/power button. What did that sign mean? I’m afraid to try to open it again. I only have one password on it. Shift-Apple-Q apparently on High Sierra, without the need to change security settings. Sorry, Control-Apple-Q — the other one logs you out.